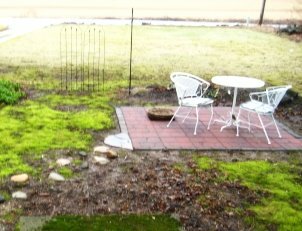 This is my front patio, started in the spring of 2008. My husband bought the materials and I did all the work. 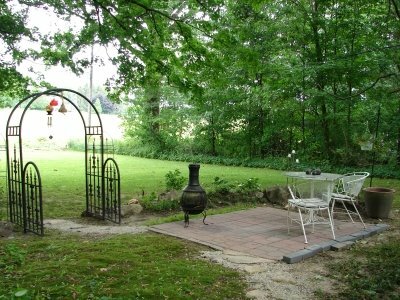 Later that summer he bought me an arch with a gate and I planted more flowers around the crescent mound. I found a large clay pot in Michigan and moved the double hook beside it. I also found a white hydrangea and planted it on the other side of the mound. My plan is to have a hydrangea privacy hedge to make the area a little more secluded and intimate. Originally, I was going to make a fire pit. You can see a wicker basket I set in the hole in the first picture. Then, I thought I would line the pit with bricks–second picture. 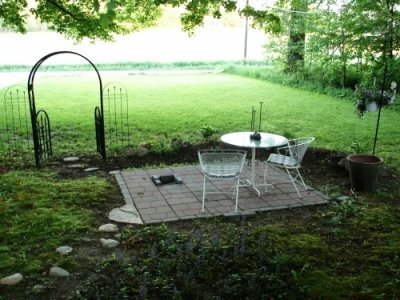 This summer, we found a cast iron chiminea, so I got another patio block and filled in the space for the pit. The chiminea can be moved around as it suits. I also got another hydrangea, which is a different shape and has lime green flowers. I’ll look for one more white one to finish that side of the mound. Hopefully, I’ll get time to turn the large pot into a water feature and plant more sedum around the patio edges. Because this is beneath a large maple tree, it has been difficult to compete with the roots when planting. I built up an area on either side of the smaller arches and planted dark purple clematis vines. When I first came to the Lord, He had a plan for me. He took my bare, ugly life and began His transforming work. Little by little, He has continued to add those things that please Him. Flowers to beautify. An arch and gate through which people are welcome to come in and fellowship. Larger bushes to shield me from the harsh winds of the enemy. A “water” feature for times of refreshing. I am a work in progress. And just as I see my garden finished in my mind, God considers me perfected through the shed blood of His Son, but He knows there is much work to be done before that is a reality! Beautiful analogy, Mid! And I love your little garden respite–it takes a while to flesh them out, but aren't these oasis' in our lives wonderful? So sweet to see it building up and growing outward by the year! Your writing, as always, is lovely. I'd love to sit and have a cup of tea with you in the place you constructed.